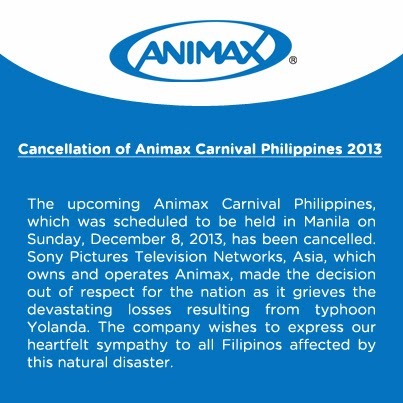 The upcoming Animax Carnival Philippines, which was scheduled to be held in Manila on Sunday, December 8, 2013, has been cancelled. Sony Pictures Television Networks Asia, which owns and operates Animax, made the decision out of respect for the nation as it grieves the devastating losses resulting from typhoon Yolanda. The company wishes to express our heartfelt sympathy to all Filipinos affected by this natural disaster. The announcement was made last week, November 20, 2013. I'm reposting this for further reference. In addition, Animax Philippines will announce should there be the opportunity to organize Animax Carnival in 2014. Stay tuned to Animax on SkyCable Channel 46 and Cignal Digital TV Channel 34, or you can log on regularly to the Animax website (www.animax-asia.com), or ‘Like’ the Animax Facebook page www.facebook.com/animaxasiatv, or follow the Animax Twitter account (https://twitter.com/animaxasiatv) for the latest updates.